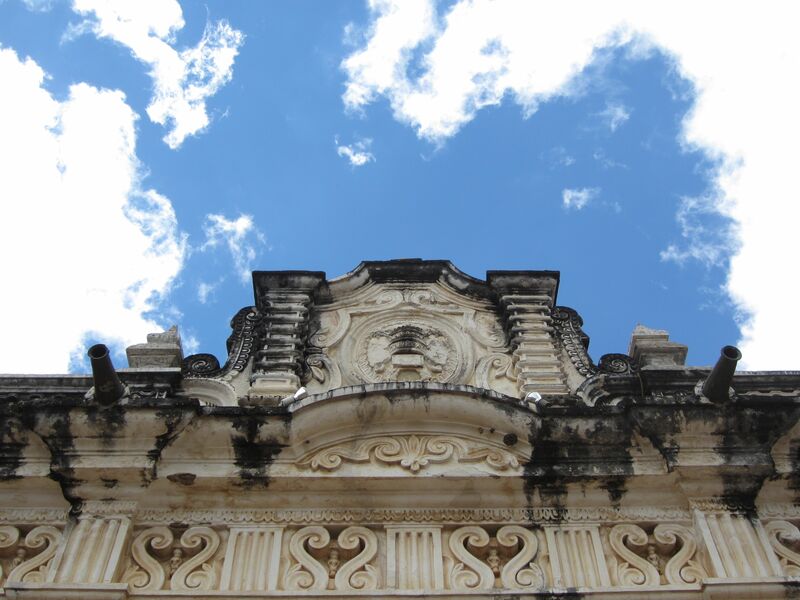 Reaching towards the sky….lies the impressive building which hosts the Museo de Arte Colonial in Antigua. After our glorious visit to the impressive ruins of the Catedral de Santiago, I understood how fabulous my day in Antigua was going to be. Not only was I thrilled and excited about exploring more of the city’s treasures and hidden gems, I also knew that I had a tour guide (my friend Lucy) who knew the best places in this UNESCO heritage city to see. With her keen eye for discovering the most unique photo opportunities and her love of culture and architecture, I knew that I was going to soon run out of juice on my camera (which I eventually did mid-day yet thankfully every true photographer has another camera ready to go. Lucy’s was happy to let me use her spare camera for the remainder of the day). Our next stop was the ancient building of the Universidad de San Carlos (founded in 1676 and today located in Guatemala City). 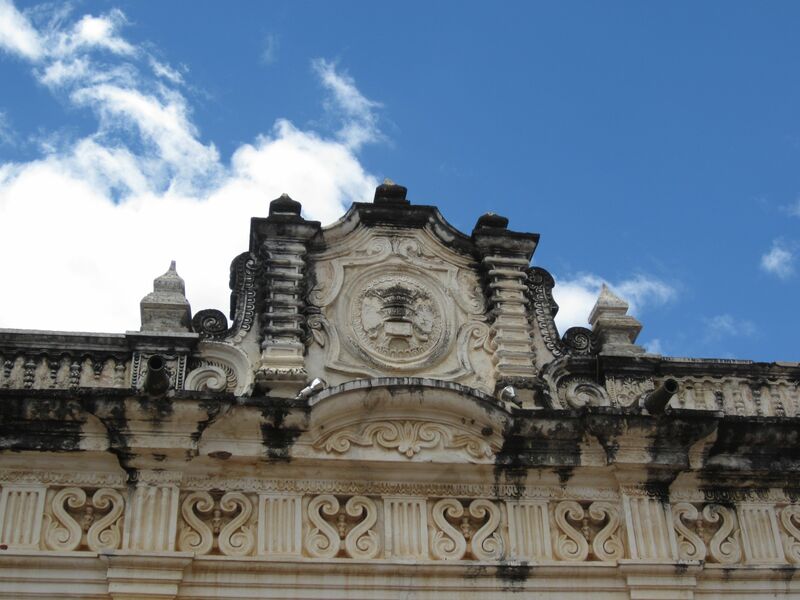 Here is housed the impressive Museo de Arte Colonial which features art from the colonial era. To be quite frank, the art is not exactly the reason why you visit this museum. The art is rather dark, drab and quite honestly, a bit boring. 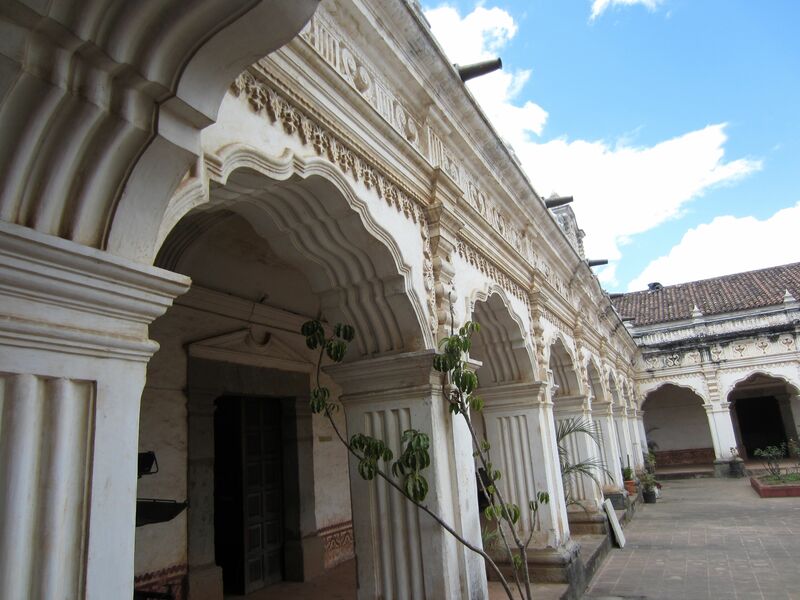 The true beauty of this museum is the spectacular colonial architecture of the building itself. I was so glad to see the cloudy, gray day disappear and turn into this wonderful deep blue sky dotted with white, fluffy, powder-puff clouds. They made the pictures all the better! I love the arches. The museum is located in the dark doorways inside the archways. The works were poorly lit, which didn’t make sense to me. It made you want to leave instead of stay inside to admire the art. 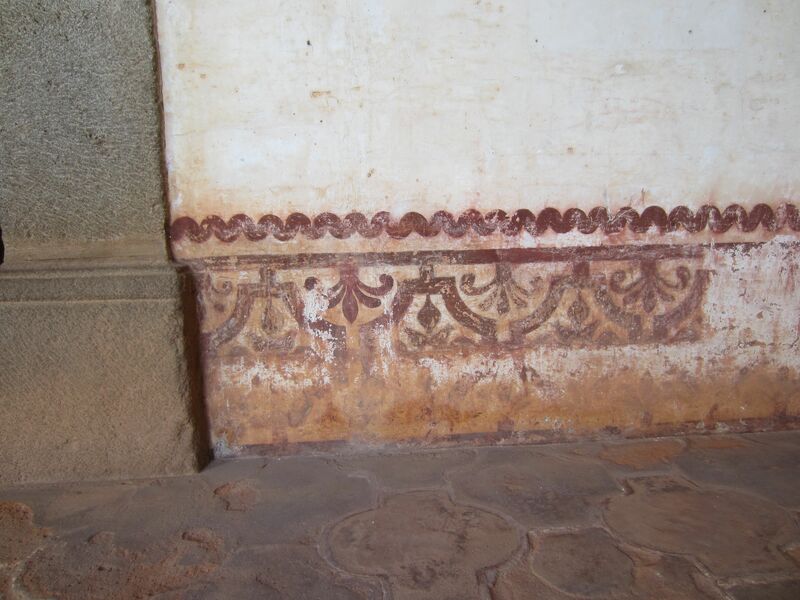 Some of the original carvings remain. The detail is amazingly intricate. 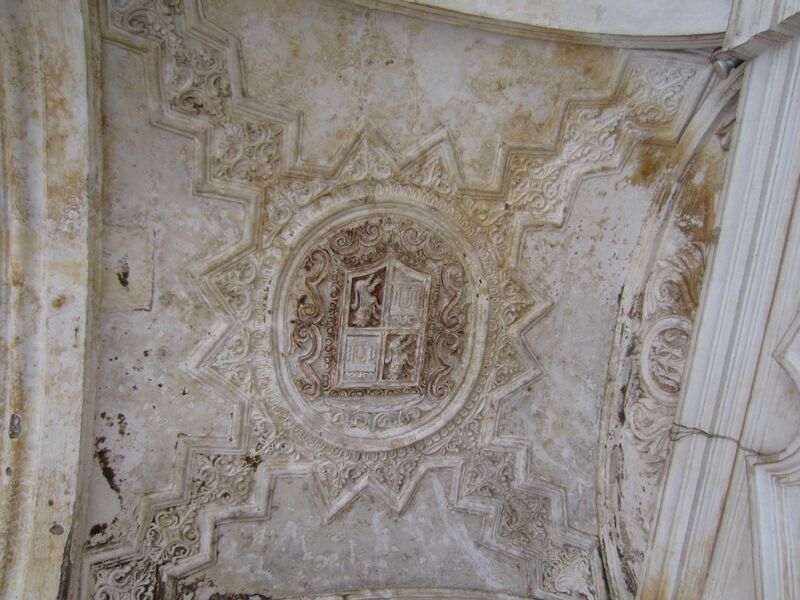 I like it when things are not completely renovated like the panels above. It gives a place more charm. 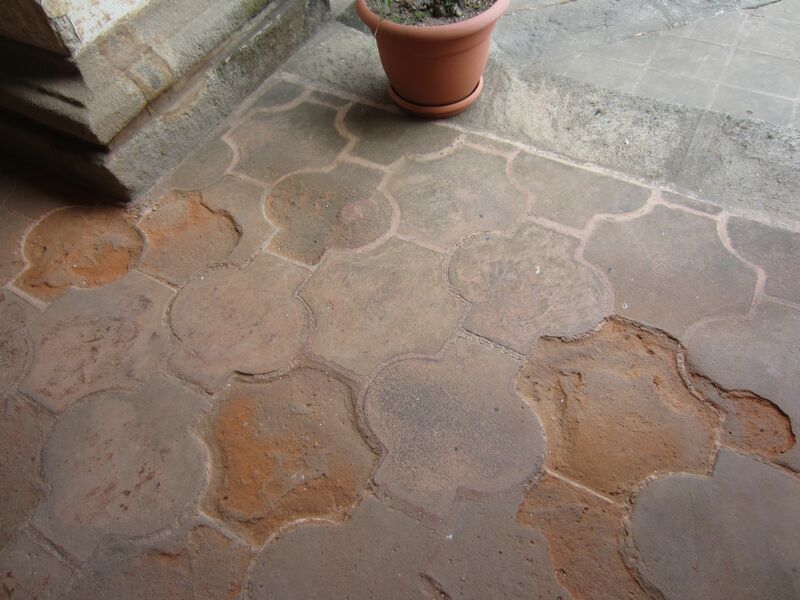 The floors were pretty too. I like their imperfections. When Lucy and I entered the museum, there were no other visitors in sight except an odd collection of locals all wearing the same turquoise-colored shirt. They weren’t there to admire the art or the splendid architecture. Not at all. Confused, I asked Lucy what was going on and she told me that this was a common marketing tactic seen in Guatemala. 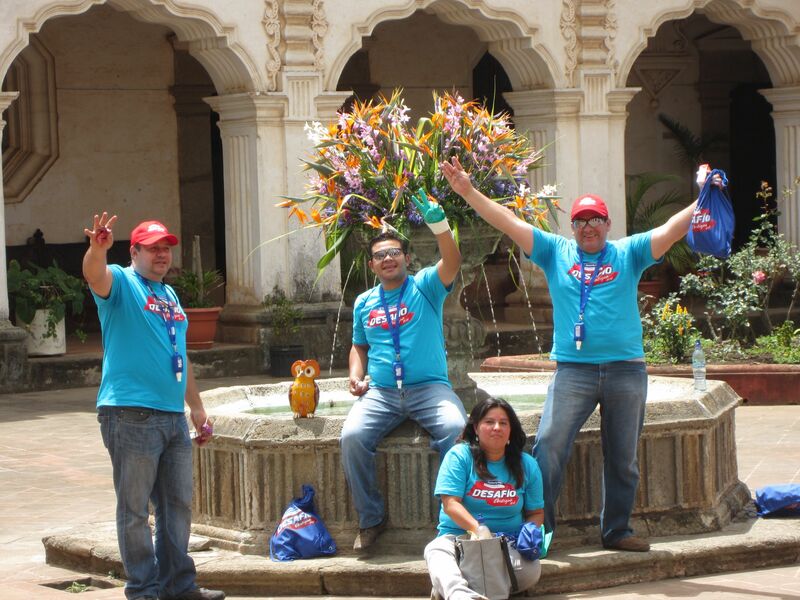 The turquoise t-shirted Guatemalans were representing a cleaning company and were trying to market their services! Why inside a museum, I have no clue. However, of course, it was one of those cultural, “third-eye” moments in which I had to snap a picture of the cheering mass. We left ready to explore more of Antigua’s many sites. The only problem was time. It was running out! There was so much to see and so little time. My camera battery was dwindling too. Plus our stomachs were rumbling. Would I ever be able to satisfy my urge of “doing Antigua in full”? Was it possible? You’ll have to wait and see! 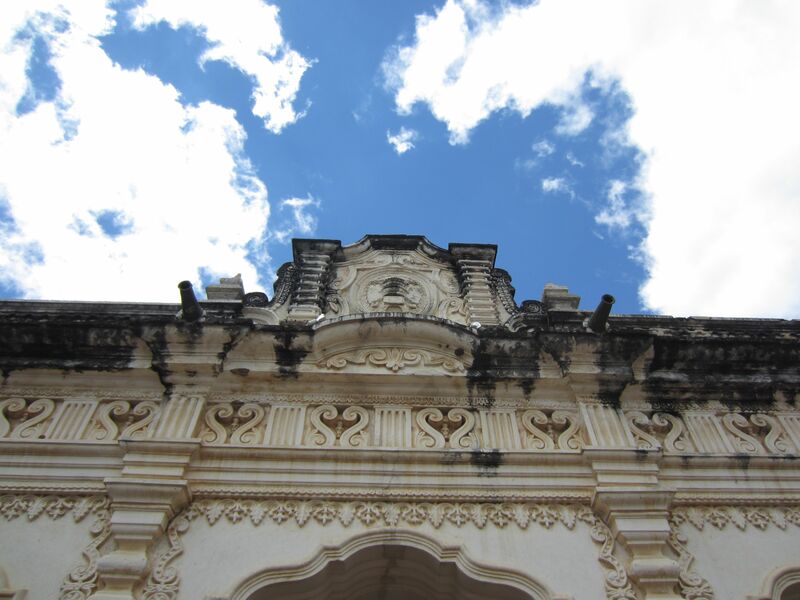 Stay tuned….for what comes next in my amazing day in Antigua! (Wish I could go back!). Beautiful pictures. the architecture is amazing. What else did you see whilst you were there? how was the food? Did you find any unique stuff there that you thought was particularly cool? If you did, did you take any pictures it/them? Thanks for your comments! 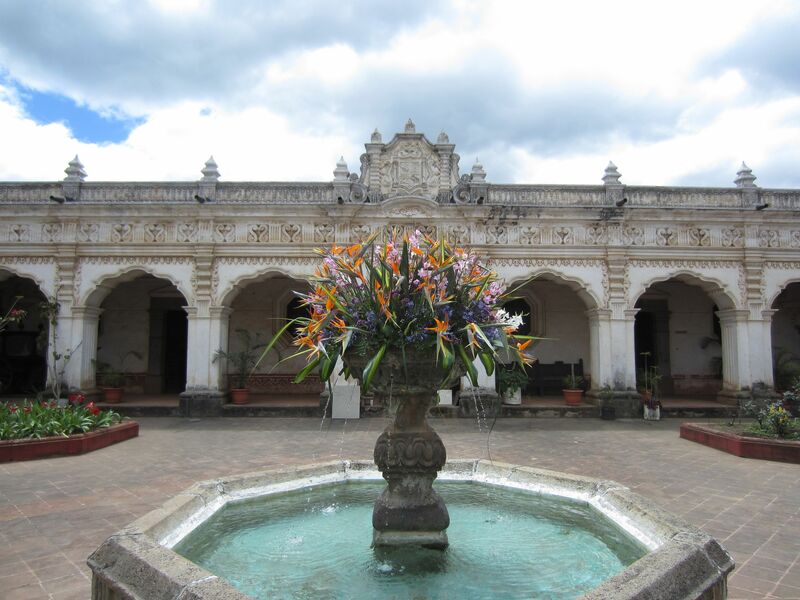 If you are new to my blog, then check out my older posts on Guatemala. I did a ton and now I’m at the tall end of the series on Guatemala. I climbed a volcano which was by far the highlight. The food was fabulous and there is so much more to see! If you want to visit the earlier posts, just scroll down on the blog to the bottom where it says “Guatemala” on travel by country. That will bring you to all my older posts. I loved it there! Hi there! I really like reading about your travel adventures. Some of the experiences you describe make me feel that I am right there with you! Especially, some of the hikes! I am awarding you the Versatile Blogger Award and you can check out my site to see what it is all about. I don’t know if you are already familiar with it (its been making the rounds) but it is my way of showing how much I enjoy your blog. Happy Trails Always! It really IS a beautiful building and far more interesting than the colonial religious art in the dingy interior! The blue shirt gang certainly made it a more interesting experience!!! I was a little surprised to see them there and not in Parque Central. Me too. Is it a common experience to see t-shirt clad gangs like this in Antigua? I never really asked you! Sometimes but usually around Parque Central where there are more people. Maybe they were taking a break or practicing! Great! I already have three more in queue but just need the time to finish writing them!